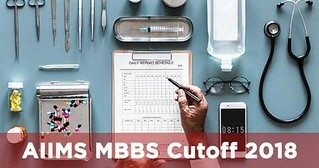 AIIMS MBBS Cutoff 2018 – The conducting body of AIIMS MBBS 2018 entrance exam, AIIMS Delhi will be announcing the cutoff scores after the announcement of the result. AIIMS MBBS cut off 2018 percentile are the minimum percentile that candidates must obtain to get shortlisted for the counselling rounds. There are nine AIIMS, and each one will have their own AIIMS MBBS 2018 cutoff scores. Based on various factors, AIIMS cutoff will be prepared and will vary with the category of candidates and institute. The AIIMS MBBS entrance test was held in online mode on 26 and 27 May 2018 across 171 cities. There are a 9 AIIMS in total offering 807 MBBS seats. More than 2 lakh candidates appeared for AIIMS MBBS 2018, and the result is scheduled to be announced on or before 18 June 2018. Go through this page for more details on AIIMS MBBS Cut off 2018. What is AIIMS Cutoff 2018? How is AIIMS MBBS Cutoff 2018 prepared? What is AIIMS MBBS normalization procedure? Since AIIMS MBBS was held in four different shifts, therefore it is expected that the cutoff percentage will be different from each other. Then, the AIIMS MBBS normalization procedure will be implemented, i.e. the lowest of the four percentiles will be considered final qualifying cutoff. What will be AIIMS MBBS Cutoff 2018? As mentioned earlier, the AIIMS MBBS cut off 2018 will vary with each institute. The tables below provide the expected AIIMS cutoff ranks of various AIIMS, prepared after analysis of previous year’s cutoff scores. What is the AIIMS MBBS tie-breaking process? Biology percentile: At first, the percentile in the Biology section of the candidates will be compared. Greater the percentile, better will be the candidate’s rank. Chemistry percentile: If the tie remains unbroken, then the Chemistry percentile will be checked. Candidates having higher percentile in Chemistry will be better rank. Physics percentile: The third option, i.e. comparison of Physics percentile will be measured if the tie remains. Candidate with the highest percentile in Physics will be given higher rank. General Knowledge percentile: This is the last subject of which the percentile will be compared. If the tie still remains, then candidate with better percentile in GK will be given higher rank. Age: The last card to break the tie will be the candidate’s age. Senior the candidate, higher will be the rank. Soon after the announcement of AIIMS MBBS result 2018, notification regarding the counselling will be released. AIIMS Delhi will be publishing the list of candidates, i.e. rank-wise and roll number-wise qualified for the counselling rounds. For the first AIIMS MBBS counselling rounds, number of candidates will be four times the number of seats available. Candidates whose names are mentioned on the list are required to visit the AIIMS MBBS counselling rounds along with the necessary documents.